Want to Plan a safe, fun & comfortable trip to Walt Disney World? 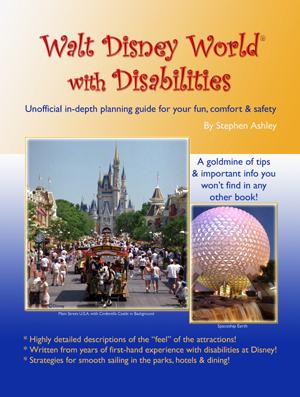 Walt Disney World with Disabilities was designed to help people with minor to major health & emotional issues, special needs, handicaps and disabilities. Planning for Disney without these issues can be complex and most people never find out about all of the support they can receive at Disney. This book is designed to help you plan a much more comfortable, relaxing and fun vacation. You’ll find what you need to take the guesswork out of your vacation. The book was fact-checked and contributed to by current and former Disney employees as well as Disney oriented travel agents, fan site owners and other Disney guests. You’ll find inside information that can make a great impact on your trip. The most in-depth and full descriptions you’ll find of the physical and emotional “feel” of Disney World rides & attractions. * What rides are right for you? Which rides should you avoid? This book is has the detailed information you need to make informed decisions. You’ll have inside information gathered through years of first-hand experience visiting Disney World while dealing with health issues. Plus we added the results of extensive research, including input from other Disney guests with a wide variety of health conditions, special needs and disabilities. You’ll get details you won’t see anywhere else that can help you plan a smooth, pleasant and safe trip! Warnings & alerts you won’t see elsewhere about things that can cause problems for people with health conditions, disabilities and special needs. For example, one popular attraction, unexpectedly pokes you in the back. We tell you how folks with back pain can enjoy the attraction anyway, while avoiding this jab to the back. How to participate in attractions & rides with greater comfort even if you have disabilities, concerns and special needs. We include many important tips that will help you enjoy more of what Disney has to offer, while avoiding discomfort. Support for diet issues in the parks, resorts and entertainment area restaurants, with contact numbers around Disney World for help with your specific dietary needs. And more! Actually MOST people dealing with disabilities and special needs will find this book terrific for planning! Transportation — Know your options and how to make use of Disney World transportation. We’ll help you avoid uncomfortable situations and even long lines. There’s extensive info for wheelchair, scooter and electric vehicle users. including claustrophobia, fear of the dark, spookiness, sudden scares and discomfort with violence. We’ll let you know if an attraction may be scary as well as the potential intensity of the scare, wherever it’s relevant. Allergy & chemical sensitivity information including what rides have fragrances and smoke pumped in, mold and mustiness alerts, smoking and Disney World pesticide information in the parks and resorts. Tips for taking and using medicines and medical equipment in the parks and resorts. Advice on how to have your specific needs met in the Disney resorts and parks. Disney Resorts — We’ll help you decide if you should stay at a Disney resort, and how to pick a resort that’s right for you. Find out what your options are for having your room prepared to meet your needs. Sometimes Disney fulfills your requests, but sometimes they don’t. We’ll give you valuable tips on what you can do to better your chances that your requests are followed up on by your resort. Take advantage of the many services Disney provides to those with special needs and disabilities that many people never find out about. We didn’t know what was available to us for years. Now we do and we’ll share that with you! A “Quick Notes” section for each attraction will give you a quick and easy to read overview of the features that are most likely to impact a physical or emotional condition. Take this to the park with you to use as an at a glance reminder support tool! An easy to Understand, conveniently designed, exhaustively researched comprehensive guide book that will bring your trip to a higher level. Rides & Attractions – Samples of ride descriptions you’ll find in the book. 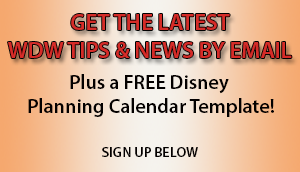 Resorts – See what’s covered regarding the Disney World resorts.